“This is the golf swing!” Tom Kite works out on his ProFlex Stretch at home. 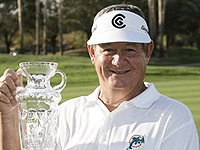 Tom is currently one of the all-time money winners on the PGA Tour. 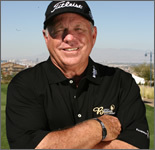 Butch Harmon “Flexibility and having or improving range of motion is the most important physical attribute to focus on for any level golfer. By increasing one’s flexibility their club head speed will automatically increase. For the aging golfer, an improved range of motion will help regain their full fluid swing. They will not lapse into punching the ball that almost always follows the loss of flexibility due to age.” The ProFlex stretching machine, used at the Butch Harmon School of Golf, was developed to keep stretching simple, effective, and address the three critical components that must be present for maximum results. 1. It keeps the user in the correct “biomechanic” position. 2. It allows the user to remain relaxed, a requirement for proper and safe stretching 3. It measures your improvement.